Sundays run is the furthest I have ever run and I now feel more confident about completing the half marathon in 5 weeks time. And, for the first time ever I am now running blister free ! I think I have finally found the right combination of trainers and socks that works for me. 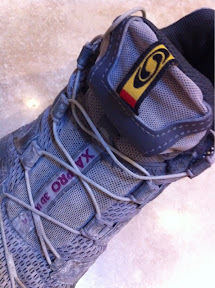 I am currently running in Salomon XA Pro 3D Ultra trainers for women..... Mine are mainly mud coloured but the did start out grey and a purple colour.... I was looking online the other evening and saw that www.wiggle.co.uk had them reduced by 35% ( they are now last years design) so I have ordered spare pair to put in the cupboard for a couple of months. I have already run over 200 miles in this pair and at the rate I'm running they have another couple of months left in them... 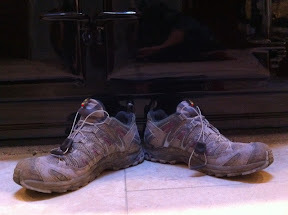 They should see me through the half marathon but then may need replacing. Unfortunately Holly has a stress fracture in one foot.... The hospital have been really good and are looking in to the cause of this, possibly a hip problem but she is hoping to find out in the next few weeks. In the meantime she is having to take a break from running and has been signed off work to stay with her foot up until the swelling has gone down... This does mean she is going to miss her first 10k race and is very disappointed.